Crude prices edged higher in early Asian session after holding near the $56 level. Despite the trade war optimism, investors remain cautious as they wait for further negotiation today and tomorrow, leaving the prices moderately changed. On top of that, The US holiday on Monday shifted the American Petroleum Institute weekly survey on crude stockpile to Wednesday from a day prior. The inventory level was last reported to have declined by -0.998M during the second week of February. The only certain point we can confirm about the bullish bias for Crude prices at the moment, is the weakening greenback which is playing a huge support system for the Dollar-denominated commodity. 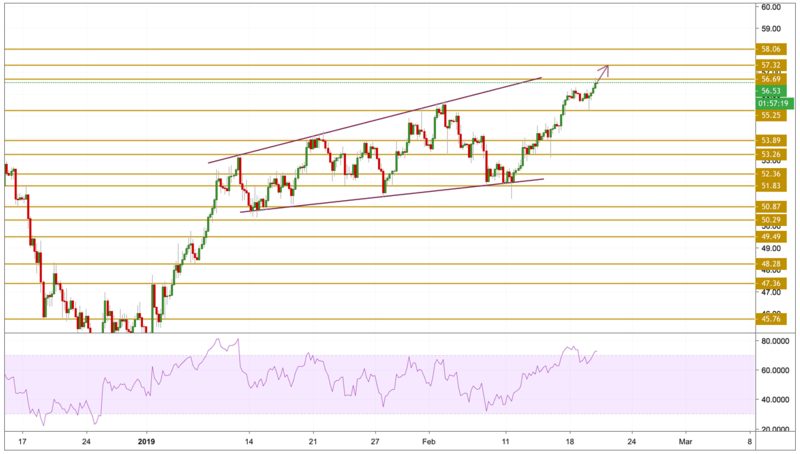 As expected, Crude prices continued to march to the upside and reached the $56.69 resistance level but could not hold above it. The price is currently hovering just below it with the RSI still signaling a bullish momentum however overbought state. We will be focusing on the continuation of the upward move and in particular the $57.32 resistance level.